Mrs. Zhang slipped her hand inside her husband’s as they walked together away from the seafood restaurant. "That was a lovely evening," she said. "Thank you so much." Inspector Zhang smiled and gently squeezed her delicate hand. "It isn’t over yet," he said. "It isn’t every day that I get to celebrate thirty years of marriage to the most wonderful girl in Singapore." Mrs. Zhang giggled. "I’ve not been a girl for a long time," she said. "You will always be my girl," said Inspector Zhang. Mrs. Zhang stopped walking and turned to face him. She put her arms around his neck and stood on tiptoe to kiss him on the lips. "I will love you until my last breath, and beyond," she said. "That’s probably the lobster and the champagne talking," said Inspector Zhang. Mrs. Zhang laughed. "It was very good lobster," she admitted. She released her grip on his neck and slid her hand into his again. The restaurant that Inspector Zhang had taken his wife to was on a quay overlooking the Singapore River, with cute little tables and candles in old wine bottles and a chef who cooked the best lobster in the city. The chef was known to have a predilection for the ladyboys of Orchard Towers but his culinary skills were such that everyone turned a blind eye to his weakness. As they walked slowly towards where he had left his car, they saw a group of three Indian men looking up at a twelve-storey apartment block. One of them was pointing up at the top of the building. Inspector Zhang craned his neck to see what they were looking at and gasped when he saw a Chinese woman standing on the roof of the block, holding onto a railing. "I’m jumping!" the woman shouted. The wind whipped her black dress around her legs. "I’m going to jump!" "Oh my goodness," said Mrs. Zhang, covering her mouth with her hand. Inspector Zhang walked towards the building, reaching for his mobile phone. He called headquarters, explained the situation and asked for a negotiating unit to be despatched. He put his phone away, cupped his hands around his mouth and shouted up at the woman. "This is the police, please go back inside, Madam!" The three Indians looked over at Inspector Zhang. "Are you really with the police?" said the youngest of the group, a teenager wearing combat trousers and a T-shirt with a Nike swoosh across the front. "I am Inspector Zhang of the CID, based at New Bridge Road," he said. "Can you please move away, if she does fall it could be dangerous. "For her, sure," laughed the Indian. Inspector Zhang was about to scold the teenager for his insensitivity but before he could so the woman shouted again. "I’m going to jump!" she yelled. Inspector Zhang cupped his hands around his mouth. "Please stay where you are!" he shouted. "We can talk about this." "I’m going to jump!" screamed the woman. "Don’t try to stop me!" "What’s your name?" shouted Inspector Zhang. The woman shouted something but the wind whipped away her words. "What did she say?" asked Inspector Zhang’s wife. "I didn’t hear," he said. He cupped his hands around his mouth and shouted up at the woman again. "What is your name?" "Okay Celia, please step away from the edge. I will come up and talk to you." More passers-by were stopping to look up at the building and cars were stopping in the road, drivers trying to see what was going on. Inspector Zhang waved at the cars to keep moving but no one paid him any attention. Suddenly he heard screams and he turned around just as the Chinese woman slammed into the ground with a sickening thud. Blood splattered across the pavement. The spectators scattered and one of the Indian men began to wail. "Please, would everyone move back," said Inspector Zhang, holding up his warrant card. "I need everybody to get away from the body now." Inspector Zhang went over to his wife who was staring at the body, her eyes wide. He put his arm around her. "You have to go home, my dear," he said. Mrs. Zhang frowned. "Aren’t you coming?" "I’m the first officer on the scene," he said, putting his arm around her slim waist. "I have to stay. I’m sorry." She knew what it meant to be married to a policeman, especially one who was as conscientious as her husband. "I’ll wait up for you," she said and stood on tiptoe to kiss him on the cheek. "You’d better," said Inspector Zhang, giving her his car keys. As Mrs. Zhang headed towards the car Inspector Zhang used his mobile phone to contact headquarters to report the death and to cancel the negotiating team. The operator promised to despatch an ambulance immediately. Inspector Zhang ended the call and phoned Sergeant Lee. She was at home and he asked her to come to the scene as soon as possible. something to see - a dead body. During his career as a policeman, Inspector Zhang had seen many dead bodies but most people were rarely confronted by death and when they were they tended to stop and stare in morbid fascination. The woman was lying face down, one leg twisted awkwardly, one arm under her body, and a pool of blood was slowly spreading around her head. He didn’t need to check for signs of life. 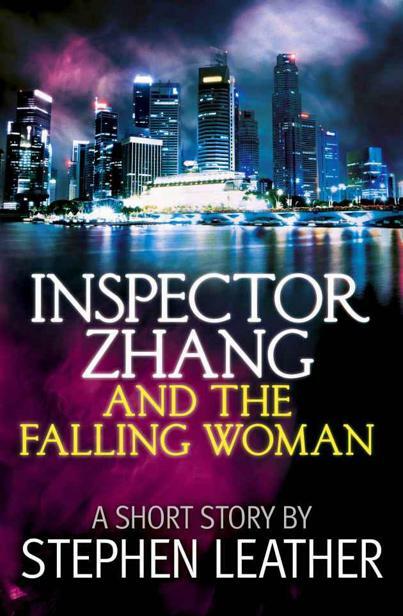 Her dress had ridden up her legs exposing her thighs and Inspector Zhang tenderly pulled it down. As he straightened up, a patrol car arrived and two uniformed policemen got out. Inspector Zhang showed them his warrant card, explained what had happened, and asked them to help keep the onlookers away. There were now more than fifty people pressing around trying to get a look at the body. Sergeant Lee arrived just ten minutes after Inspector Zhang had called her. She was wearing a dark blue suit and had her hair clipped up at the back. "I’m sorry to bring you in so late but I was the first on the scene," said Inspector Zhang. "But you’re not on duty tonight," said Sergeant Lee. "An inspector of the Singapore Police Force is always on duty," said Inspector Zhang. "But isn’t it your thirtieth wedding anniversary tonight?" asked Sergeant Lee, walking over to the body with the inspector. "My wife understands," said Inspector Zhang. "Did she jump?" asked the Sergeant, leaning over the body and taking out her notebook. "She was calling out saying that she was going to jump and I was trying to talk to her but…"
He shrugged. "Sometimes there is nothing that can be done to stop them." Sergeant Lee looked up at the building and shuddered. "This is your first suicide?" asked the inspector. "It is not uncommon in Singapore," said Inspector Zhang. "We have an average of four hundred a year, more during times of economic crisis." "I don’t understand why anyone would kill themselves," she said. "Especially a young woman." "It’s usually because of money, or an affair of the heart. But our suicide rate is still well below that of Japan, Hong Kong and South Korea." "I suppose because our lives are better here in Singapore," said the sergeant. "Do you know which country in the world has the highest rate of suicides?" asked the inspector. Sergeant Lee shook her head. "Lithuania, followed by Russia," said Inspector Zhang. "Their suicide rates are four times ours." He looked down at the body. "And like you, I can never understand why anyone would want to take their own life." "I don’t see a bag or a wallet," said Sergeant Lee. "That’s not unusual," said Inspector Zhang. "Suicides generally take off their glasses and leave their belongings behind. A man, for instance, will often take out his wallet, keys and spare change and place it on the ground before jumping." He shrugged. "I don’t know why, but that’s what they do." An ambulance pulled up in front of the building and two paramedics climbed out. Inspector Zhang went over to speak to them, then returned to Sergeant Lee and told her to accompany her into the building. The glass-doors were locked and there was no one sitting behind the counter at reception. "They probably only have the desk manned during the day," said the inspector. There was a stainless steel panel set into the wall with forty numbered buttons and a speaker grille. At the top of the panel was a small camera set behind thick glass. Inspector Zhang pressed button number one. After a few seconds a man asked him in Chinese who he was and what he wanted. Inspector Zhang held up his warrant card and replied in Mandarin, telling the man who he was and that he required him to open the door. The lock buzzed and Sergeant Lee pushed the door open. Inspector Zhang thanked the man and put away his warrant card. He followed Sergeant Lee into the marbled foyer and looked around. "No CCTV," he said. "That’s a pity." There were two elevators and he pressed the button to summon one. "Some residents find them intrusive," said Sergeant Lee. "They wanted to install them inside our building, but too many people objected." "If you do nothing wrong, you have nothing to fear from CCTV," said Inspector Zhang. "Some people prefer to keep their privacy, I suppose," said the sergeant. The elevator arrived and they took it up to the tenth floor. There they found a door that led outside. It opened onto a stone-flagged roof where there was a small white-painted gazebo and several wooden benches. There was a barbecue area and a dozen tall palms in earthenware tubs. Sergeant Lee pointed at a Louis Vuitton handbag on one of the benches. "There, Sir," she said. , the card carried by every Singaporean. The card was pink, showing that she was a citizen. Cards carried by permanent residents were blue. "Celia Wong," said Sergeant Lee, reading the card. "So young," said Inspector Zhang, staring down at the pavement far below. The crowds had moved on and there was no sign that a woman had died there. There would be blood on the pavement still, thought Inspector Zhang, but he couldn’t see the red stain from the roof. "I’m twenty-four," said Sergeant Lee. "I meant so young to kill herself," said the inspector. "She had her whole life in front of her. Why would she want to end it?" Sergeant Lee shrugged, not knowing what to say. "Where does she live?" asked the inspector. "A building in Yio Chu Kang," she said. "I know the building. It’s a Housing and Development Board block." "Are you sure?" asked the inspector, turning to face her. Sergeant Lee nodded. "I was there on a case last year," she said. "Shall I phone the husband?" The Long Hunt: Mageworlds #5 by Doyle, Debra, Macdonald, James D.